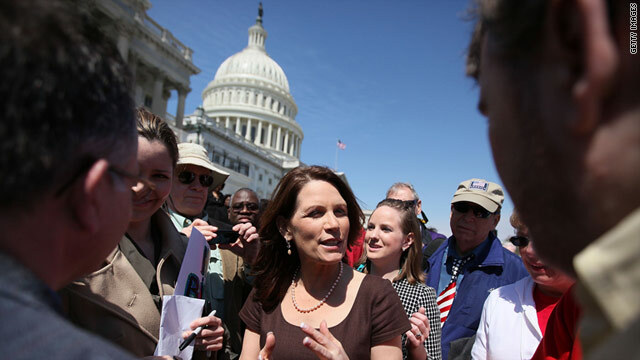 Rep. Michele Bachmann (R-MN) speaks to supporters after a Washington rally April 6 in support of spending cuts. -- Heartbreaking employment numbers for May. -- Weak economic growth in the first quarter. -- A housing market that has now subsided all the way back to its level of 2002 -- or to 1999, if you adjust for inflation. The numbers only summarize the anxiety and misery of millions of hard-pressed Americans. Politically, the desperate and angry mood of the country opens a huge vulnerability for President Barack Obama. Presidents who inherit economic crises get re-elected when they deliver positive results. Unemployment dropped by 2 percentage points in the third year of Ronald Reagan's first term, and then by another 1 1/2 points in the fourth year. Result: a 49- state landslide. The U.S. economy strongly recovered in Franklin D. Roosevelt's first term as well. By election day 1936, production had nearly caught up to 1929 levels. Unemployment had been reduced as well, although not nearly so impressively. Result: Roosevelt won every state except Maine and Vermont. More than half way through his term, Obama has no such story to tell. Eight million people lost their jobs in 2008-2009. Two million jobs have been created, net, in 2009-2011. You do the subtraction. So Obama could lose if -- and here's the big if -- Republicans do not blow the opportunity by presenting themselves as Medicare-annihilating racist maniacs. That seems obvious, right? As Texas Sen. Phil Gramm phrased it on the campaign trail in 1996 to a struggling Republican House challenger, "There are only two issues when running against an incumbent. Her record, and I'm not a kook." There are only two issues when running against an incumbent. Her record, and I'm not a kook. Did Palin take media for a ride? Ron Paul: A serious contender in 2012? 1) Focus on the president's record. 2) Do not allow the militant wing of the party to bind the whole party to election-losing issues. 3) Keep the kooks off the main stage. And yet this simple plan is proving surprisingly hard to execute. In other words, Republicans are in danger of violating point 2 of the incumbent-defeating plan. Meanwhile, the conservative entertainment complex seems bent on trashing point 3. So far this year, Fox News and talk radio have pushed Donald Trump and Michele Bachmann as top-tier presidential candidates. Now they are trying the same for Herman Cain, while lovingly publicizing Sarah Palin's donation-seeking bus tour. Yes the American media always loves a freak show. But a political party does not have to cooperate. No Republican politician -- not even a retired one with nothing to lose -- ever took the kind of hard line against birth-certificate conspiracy theories as former president Bill Clinton took against the 9/11 deniers. I've heard Republicans in private deplore the racial incitement that too often substitutes for conservative talk. But in public, who has a word to say when the popular home page of the DrudgeReport strings together local news headlines of college-student rowdiness over Memorial Day to create a (false, obviously) image of the Obama administration licensing a nationwide eruption of African-American anti-white violence? The Republican presidential field offers serious, capable candidates with records of successful governance, including front-runner Mitt Romney. Rep. Paul Ryan's budget plan has been adopted by the House Republican caucus, but presidential candidates and senatorial candidates are free to distance themselves. The Obama re-election plan for 2012 is to divert attention from four disappointing economic years by showcasing every wacky, wild, extreme or frightening statement by a national Republican. The Tim Pawlenty campaign did their bit to help Obama just this past week. Candidate Pawlenty was asked in Iowa whether women who have abortions or the doctors who perform them should be subject to criminal penalties. His answer: no. "Eric Woolson, the veteran Iowa GOP operative who is Pawlenty's senior adviser and communications consultant, called the Daily Times Herald after the interview to elaborate on Pawlenty's comments Monday. "As you know, this was the last question in the press scrum and discussion got chopped off." Woolson said, "To be clear, if Roe v. Wade is overturned, the issue of abortion returns to the states for them to decide the issue and penalties, if any. As to the governor's views on these matters, he believes that if abortion becomes illegal, abortion providers should be subject to a penalty possibly including a criminal penalty. However, he does not believe women should be penalized." This may be the first case on record of a candidate getting the answer right, and his campaign swooping in later to commit a gaffe. The campaign of course was worrying about negative reaction from pro-life GOP Iowa caucus-goers. A future president should be thinking of the whole nation. Tea Party conservatives complain that Republicans who advocate restraint, responsibility and moderation do so in order to be nice to Obama. That's utterly upside down. Restraint, responsibility and moderation are indispensable to the defeat of President Obama. It is Tea Party conservatism itself that is Obama's last, best hope for a second term. The Obama campaign can only redirect attention from the president's own record to GOP kookiness if the GOP cooperates. The conclusion that you'd think would follow: don't do it.